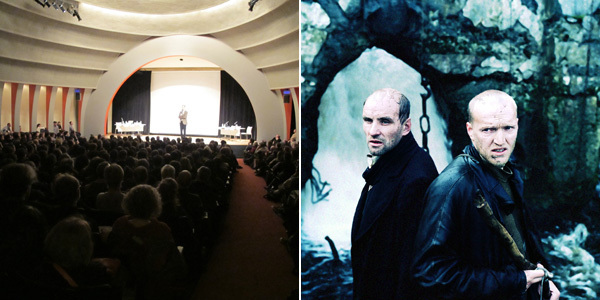 Left: A view of “Tarkovsky Interruptus” at the New School, March 10, 2012. Right: Andrei Tarkovsky, Stalker, 1979, color film in 35 mm, 163 minutes. Production still. This was one of many anecdotes and off-the-cuff analyses about Stalker on offer during a screening-plus-panel-discussion last Saturday evening in a packed auditorium at the New School. Organized by the NYU Institute for the Humanities and keyed to a new book on the film by British author Geoff Dyer, Zona: A Book About a Film About a Journey to a Room, the appropriately named “Tarkovsky Interruptus” consisted of a projected DVD showing of the film, periodically paused to allow the six-person panel to comment on what had just transpired on-screen. Dyer was joined by Walter Murch, the sound and film editor, best known for his 1970s work with Francis Coppola; novelist Francine Prose; filmmaker Michael Benson; author Philip Lopate; and film critic Dana Stevens. Before the screening began, Dyer delivered a brief introduction. Calling the event’s format a “potentially irritating way to see Stalker,” he asked for a show of hands from those who’d previously seen it. About 50 percent. He warned the other half that the movie “does not move at the pace of a James Bond film, but is never more boring than a James Bond film.” (Dyer is a deliciously Bernhardian high priest of complaint, often about mainstream culture.) He apologized that the we wouldn’t be watching celluloid—apparently, not one print of Stalker currently resides on North American soil—and recounted the difficulties he and his publisher had had in finding a proper still for the book’s cover, an international intrigue that Dyer compared to a John le Carré novel. Recalling his first viewing of the film during its initial run in England (1981), he said that Stalker changed the way he sees the world. “People like to think of Tarkovsky as persecuted by the [Soviet] system, but he got the money for films that couldn’t have been made in the West due to the other type of censorship—the censorship of the market.” He described the arduous, troubled production process of the film—a year’s worth of footage lost to a developing error, cinematographers leaving or being fired, the film board almost pulling the plug, etc.—and then the lights dimmed for the screening. Left: Robert Polito, Francine Prose, Phillip Lopate, Michael Benson, Walter Murch, and Dana Stevens at “Tarkovsky Interruptus” at the New School, March 10, 2012. Right: Andrei Tarkovsky, Stalker, 1979, color film in 35 mm, 163 minutes. Production still. I’ll spare you a plot summary that may be too long or excessively detailed. Suffice to say that the movie is about the titular Stalker, a poor, ascetic tour guide of sorts, who for a fee takes visitors to a forbidden Zone in the country that has been cordoned off and is guarded with lethal force by the military. Legend has it that a meteor or even a spaceship landed there years ago, and odd things started happening in the area. Unable to “tame” or figure out the secrets of the Zone’s invisible force, the military abandoned buildings, tanks and jeeps, and other industrial detritus to the creeping tendrils and severe water damage of nature. Legend also has it that in one of the rotting buildings is a room that will grant the innermost wish of any who enter it. In the film, Stalker takes Writer (an “in” novelist worried that he’s lost his inspiration) and Professor (a dour physicist) to the Zone, where they slowly and tortuously make their way to the threshold of the Room, all the while talking endlessly about art, science, life, doubt, and faith. It is relentlessly bleak, achingly beautiful, and truly one of the masterpieces of the medium. The film was paused again at the end of Part I. Dyer and Stevens discussed how the camera POV is slightly off in the Zone, as if the Zone itself were sentient and “following” the three men, a horror cinematography trope that Tarkovsky raises to the level of art throughout. Queried about Stalker’s striking sound design—nature sounds processed through synthesizers, music blending ancient instruments with electronics, European melodies and Eastern instruments—Murch noted that all of the sound and dialogue was dubbed after the fact, with a unique use of sound effects that was inventive if technically a bit crude. Murch also recalled that Coppola wanted to build a surround-sound movie theater in the geographic center of the United States that would exclusively play Apocalypse Now (1979), a film with which Stalker has many parallels in content and creation. Dyer said the film was “haunted by the Gulag” and “prophetic of Chernobyl.” Prose characterized an insecure rant by Writer, moaning about readers, critics, and sales, as “what all artists worry about late at night.” “It’s so Russian,” Lopate exclaimed. “They just sit around talking about their wasted lives. Chekhovian.” He continued, however, that he was sometimes resistant to Tarkovsky because some of the writing evoked Chekhov without being quite good enough to compete with him. After screening the coda of the film—a handful of scenes after the return from the Zone—Dyer announced that the trick shot of Stalker carrying his lame daughter on his shoulders (shot high and in profile, she appears to be “walking” until the camera pulls back) was for him one of the most profound moments in all of art. Benson said that his seven-year-old son, who was weaned on the quick-cut aesthetics of the Cartoon Network, once watched Stalker by himself, start to finish, without being able to read the subtitles, and later invited a young friend over to watch it with him again. The film is “constructed in a way to accommodate multiple interpretations,” Murch concurred.